Perhaps this comes under the heading of guilty pleasures, but I’ve always had a soft spot for Cardew’s Maoist songs, not least because of their unabashed absurdity. A particular favourite is “Smash the Social Contract”, which sought to rally the working class against the agreement the TUC reached in 1974 with the then Labour government to implement a policy of voluntary wage restraint. The final verse asserts that the social contract can be smashed only by the working class engaging in the struggle for state power under the leadership and guidance of the RCPB(ML). With the benefit of hindsight, you’d have to concede that this is one of the song’s weaker points. However, in the early ’70s Cardew was recruited to the Communist Party of England (Marxist-Leninist) – a Maoist group that later changed its name to the RCPB(ML) after concluding that China had been taken over by revisionist elements following the death of Mao, and that the true socialist fatherland was to be found in Enver Hoxha’s Albania. The CPE(ML) convinced Cardew that the avant-garde music he had been associated with was just bourgeois decadence. So he renounced his former musical works and those who had inspired them. 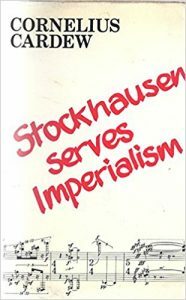 In a celebrated pamphlet entitled Stockhausen Serves Imperialism, Cardew accused his former mentor of being “part of the cultural superstructure of the largest-scale system of human oppression and exploitation the world has ever known: imperialism”, holding poor Karlheinz personally responsible for the British military occupation of the north of Ireland and the US war in Vietnam. Having rejected the musical avant-garde, Cardew composed a number of resolutely tonal piano pieces, some of which – the “Thaelmann Variations“, for example – are quite pleasant in their own musically traditionalist way. But Cardew felt the need to address the proletariat more directly. So he formed a group called People’s Liberation Music and wrote a bunch of Maoist propaganda songs for them, which they performed off the back of a lorry at demonstrations and picket lines. The leader of the international tendency to which Cardew belonged was a Canadian Maoist named Hardial Bains, who provided the words to some of Cardew’s songs. It must be admitted that this was not one of their more impressive features. For example, “The Workers of Ontario”, which is based on a text by Bains, declares that the workers of Ontario play an important role in productive labour and are a mighty section of the Canadian proletariat. I can’t imagine what the pickets made of it. Sadly, Cardew died in 1981 after being knocked down by a car on his way home from a political meeting. His comrades from the RCPB(ML) immediately concluded that he was the victim of a state assassination. A more sober explanation is that it was after dark and he was walking in the middle of the road. Those of us who were around the Trotskyist milieu in the 1970s, and look back with some embarrassment to the things we said and did at that time, can at least take consolation in the thought that things might have been worse. We could have been Maoists. Previous Post Miles Davis: “The most brilliant sellout in the history of jazz”?